One time, I had some lima beans that had sprouted, and they looked just like fetuses to me. It made me think of the complex systems that plants and creatures are, all built upon the system of a seed. Wow, we both have plant-baby fixations! This is the first time I've seen your blog... lots of beautiful & fascinating images. I'll be back! I think that this piece of art represents Freudian imagery in a small way. It has a strong relation to birth becasue of the baby fetuses and the roots looking like embilical cords. One might see the children in the ground as children in a womb. In another light one might see a Marxist element in this. For anyone who hass seen the movie "The Matrix" where humans are used like cattle, it could be that these fetuses are giving nutrients so that the plants can grow. In a system with out any boundaries we could all end up giving more than just our recources to an unchecked capitalistic form of government. One last theory that I see in this paiting is Post-humanism. 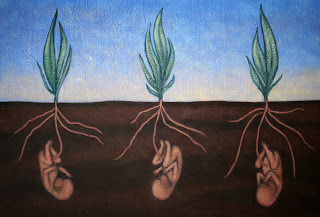 Before the fetuses are born into the world they are part of the plant. Part of a whole, they will most likely have parts of the plant inside of there geneitc code when born. So they may remain post-human forever. Great image, very thought-provoking - as the comments demonstrate. Enjoy your work v. much. Very interesting interpretation! I had a quick image of those screaming baby plants in Harry Potter! Ha! I never thought of that. But in my defense, this painting was made long before HP. Thanks for the refernce, and the kind word!